On September 16, 2015, the ABMI hosted a science symposium on Ecosystem Services and Biodiversity. 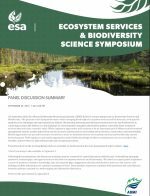 The purpose of the Symposium was to share emerging knowledge of ecosystem services and biodiversity, with specific application to challenges and opportunities in Alberta. Monitoring, assessing and valuing ecosystem services and biodiversity in a growing province like Alberta is a big challenge for environmental managers and decision makers, especially for ecosystem services that lack clear economic value. While regulatory approaches will continue to be an important part of Alberta’s environmental management system, market approaches can also promote actions such as restoration and protection, conservation, and stewardship. Market approaches can provide economic incentives to avoid or minimize the loss of ecosystem services and biodiversity caused by development. Both regulatory and market approaches need reliable knowledge of where ecosystem services are provided, who benefits, and how they are affected by people and ecological processes. View the symposium summary below (pdf).